Fill out the form to be connected with a member of the AleraHR team. 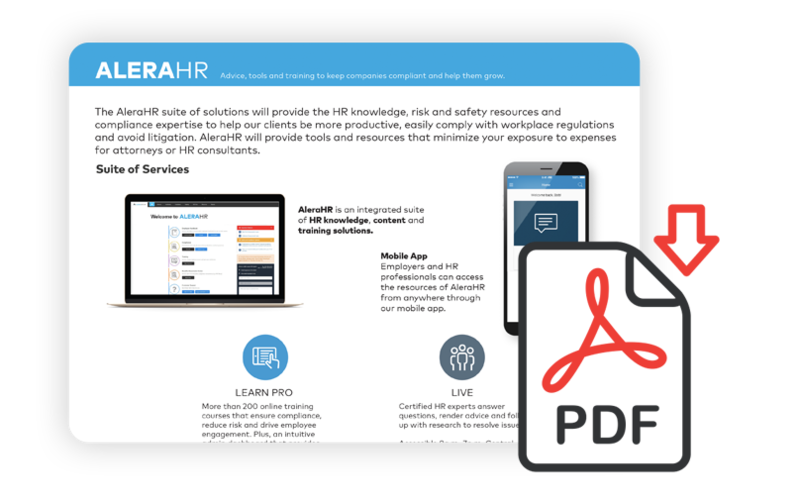 After a brief phone conversation, you will walk away with valuable insights into how the AleraHR online portal can enhance your organization’s HR capabilities. Save Time. Add Resources. Reduce Risk. Expand Your Capabilities. More than 200 online training courses that ensure compliance, reduce risk and drive employee engagement. Timely and accurate guidance on the latest news and analysis HR professionals need to stay current with changing regulations. Still curious about what AleraHR can do? Read about how the AleraHR suite of solutions can address the needs of your HR department.